Memorial Day Weekend is here - meaning the official kick-off of the summer season has commenced. Fun, sun, family, and friends are on the brain. Oh, and amazing food, let's not forget about that! Celebrate the start of what's sure to be one of your best summers yet with a dessert that is as nourishing as it is delicious. 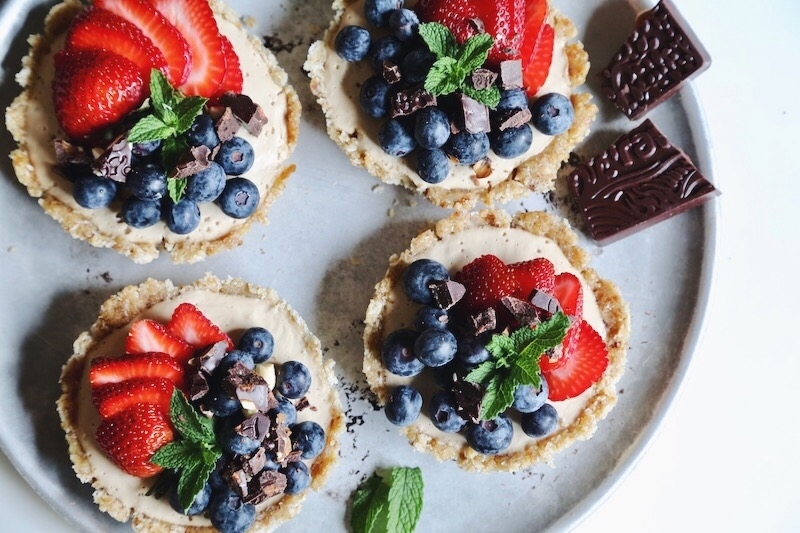 These tarts are pretty simple to prepare because let's be honest, Memorial Day Weekend is about having fun outdoors not slaving away in the kitchen. 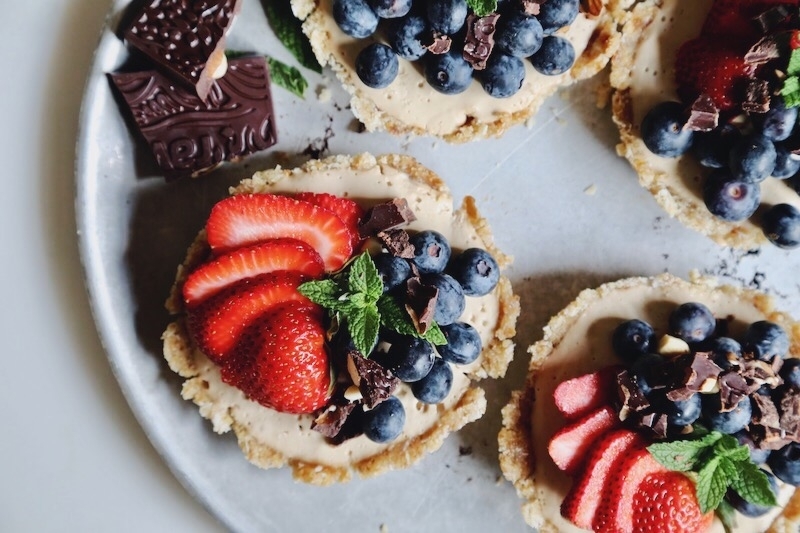 These don't require any baking or fancy cooking skills; all you really need is a good blender and some mini tart pans. Moment of truth: this recipe didn't turn out exactly how we'd intended. We set out to make a coconut vanilla cream filling, but the coconut sugar added a more-than-subtle hint of caramel and changed the color from white to light brown. But you know what? Sometimes those “uh-oh” moments in the kitchen turn out to be the biggest blessings because, well, these are downright delicious. Yes, the red, white and blue theme turned out red, beige and blue but they taste like heaven on earth. The flavor combo of the filling is reminiscent of Boston cream pie – vanilla cake meats coconut cream meets caramel meets a raw tart. Topped with berries. And raw chocolate. Are you sold? OK good! Have an amazing holiday weekend ahead! 1. In a blender or food processor, pulse ingredients together until they break down and bind together. You’ll want to be able to take a spoonful, squish it together, and have it hold its shape. Make sure all of the dates are broken down as they are what help bind the crust. 2. Scoop the crust mixture into the bottom of 4 tart/quiche pans and proceed to assemble the crust filling so that it lines the bottom and sides of the pans. 1. Soak cashew nuts for at least 4-6 hours to soften. They can also be soaked overnight to prep for the next day. Drain and rinse thoroughly after soaking. 2. Combine all ingredients in a blender (preferably high speed like Vitamix or Blendtec) and blend on a medium-high setting until very smooth – about 30 seconds. 1. Pour filling mixture into crusts. Place in freezer to set for about 2 hours. 2. 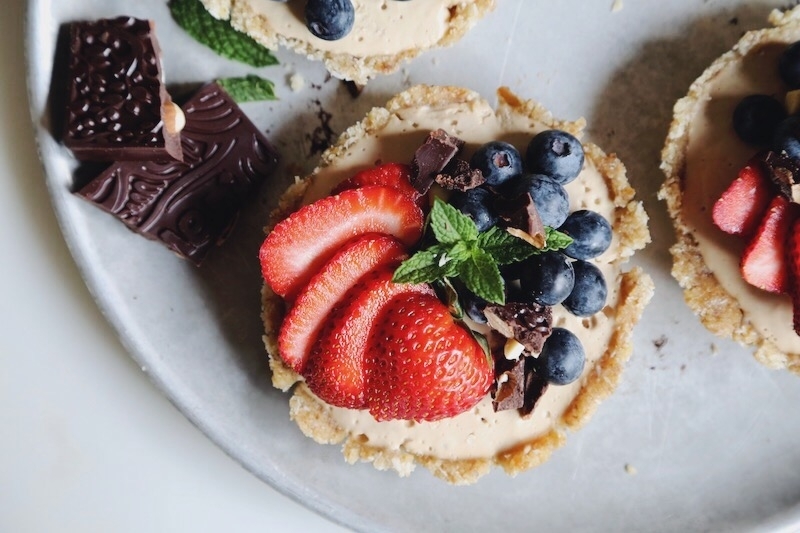 Remove tarts from freezer and take fresh berries and arrange them on top of filling, then top with crushed raw chocolate. NOTE: these will start to soften as they sit at room temperature. Best kept in the fridge until right before you serve them.